Regenerative medicine relies upon the ability to isolate, manipulate, and exploit stem cells from our own bodies or from the bodies of stem cell donors. A present obstacle to present therapeutic strategies is the poor survival of implanted stem cells. There are also worries of about properly directing the differentiation of transplanted stem cells. After all, if implanted stem cells do not differentiate into the terminal cell types you want to be replaced, the use of such cells seems pointless. To address this problem, David Mooney from the Wyss Institute and his colleagues have designed a three-dimensional system that might keep transplanted stem cells alive and happy, ready to heal. Mooney’s group has adopted a strategy based on the concept of stem cell “niches.”. In our bodies, stem cells have particular places where they live. These stem cell-specific microenvironments provide unique support systems for stem cells and typically include extracellular matrix molecules to which stem cells attach. Mooney and others have identified chemical and physical cues that act in concert to promote stem cell growth and survival. The chemical cues found in stem cell niches are relatively well-known but the physical and mechanical properties are less well understood at the present time. Stem cells in places like bone, cartilage, or muscle, when cultured in the laboratory, display particular mechanical sensitivities and they must rest on a substrate with a defined elasticity and stiffness in order to proliferate and mature. As you might guess, reproducing the right physical properties in the laboratory is no mean feat. However, several laboratories have used hydrogels to generate the right combination of chemical and physical properties. Mooney and his colleagues have made two hydrogels with very different properties. A stable, “bulk” gel is filled with small bubbles of a pore-making molecule called a “porogen,” which degrades quickly and leaves porous cavities in its wake. When the bulk hydrogel is combined with extracellular matrix molecules from stem cell niches and filled with tissue-specific stem cells, and the porogen, Mooney and his team can make an artificial bone-forming stem cell niche. The porous cavities in the hydrogel, in combination with the chemical signals, drive the stem cells to grow, and divide while expanding into the open spaces in the gel. Then the cell move from the hydrogel to form mineralized bone. In small animal experiments, Mooney and his colleagues showed that a porous hydrogel with the correct chemical and elastic properties provides better bone regeneration than transplanting stem cells alone. The maturing stem cells deployed by the hydrogel also induce neighboring stem cell populations to contribute to the bone repair, which further amplifies their regenerative effects. This study provides the first demonstration that adjusting the physical properties of a biomaterial can not only help deliver stem cells but also tune the behavior of those cells in a living organism. Even though Mooney has primarily focused on bone formation, he and his group believe that the hydrogel concept can be broadly applied to other regenerative process as well. This work was published in Nature Materials 2015; DOI: 10.1038/nmat4407. Scientists from the Gladstone Institutes have found a new technique to regrow bone by using the protein signals produced by stem cells. This new technology could potentially help treat victims who have experienced major trauma to a limb, such as soldiers wounded in combat or casualties of a natural disaster. This new protocol improves older therapies by providing a sustainable source for fresh tissue that also reduces the risk of tumor formation that can arise with stem cell transplants. This study was published in a journal called Scientific Reports, and it is the first study that successfully extracted bone-producing growth factors from stem cells and showed that these proteins are sufficient to create new bone. This stem cell-based approach was as effective as the current standard treatment in terms of the amount of bone created. Rather than using stem cells, the Gladstone scientists extracted the proteins that the stem cells secrete, such as a protein called bone morphogenetic protein (BMP). By extracting these proteins, they hoped to harness their regenerative power. McDevitt and his colleagues treated stem cells with a chemical that helped drove them to begin to differentiate into early bone cells. Then they analyzed the secreted factors produced by these cells that signal to other cells to regenerate new tissue. Afterwards, they took these isolated proteins and injected then into mouse muscle tissue to facilitate new bone growth. Currently, laboratory technicians grind up old bones and extract the available proteins and growth factors that can induce the growth of new bone. Unfortunately, this approach relies on bones taken from cadavers, which are highly variable when it comes to the quality of the available tissue and how much of the necessary signals they still produce. Also, cadaver tissue is not always available. Researchers at Columbia University Medical Center (CUMC) have discovered a bone marrow-based stem cell capable of regenerating both bone and cartilage in mice. The discovery appeared in the online issue of the journal Cell. These cells have been called osteochondroreticular (OCR) stem cells, and they were identified in experiments that tracked a protein expressed by these cells. By using this specific protein as a marker for OCR stem cells, the Columbia team found that OCR cells self-renew and produce key bone and cartilage cells, including osteoblasts and chondrocytes. Furthermore, when OCR stem cells are transplanted to a fracture site, they dutifully contribute to bone repair. “We are now trying to figure out whether we can persuade these cells to specifically regenerate after injury. If you make a fracture in the mouse, these cells will come alive again, generate both bone and cartilage in the mouse—and repair the fracture. The question is, could this happen in humans,” says Siddhartha Mukherjee, MD, PhD, assistant professor of medicine at CUMC and a senior author of the study. Since mice and humans have similar bone biology, Mukherjee and his colleagues are quite confident that OCR stem cells exist in human bone marrow. Further studies could uncover new and effective ways to exploit OCR cells to provide greater ways to prevent and treat osteoporosis, osteoarthritis, or bone fractures. “Our findings raise the possibility that drugs or other therapies can be developed to stimulate the production of OCR stem cells and improve the body’s ability to repair bone injury—a process that declines significantly in old age,” says Timothy C. Wang, MD, the Dorothy L. and Daniel H. Silberberg Professor of Medicine at CUMC, who initiated this research. Wang and his team previously found an analogous stem cell in the intestinal tract and observed that it was also abundant in the bone. “These cells are particularly active during development, but they also increase in number in adulthood after bone injury,” says Gerard Karsenty, MD, PhD, the Paul A. Marks Professor of Genetics and Development, chair of the Department of Genetics & Development, and a member of the research team. Mukherjee and his coworkers also showed that adult OCR stem cells are distinct from mesenchymal stem cells (MSCs). MSCs play essential roles in bone generation during development and adulthood. Therefore, researchers thought that MSCs gave rise to all bone, cartilage, and fat, but recent studies have shown that MSCs do not generate young bone and cartilage. This study by Mukherjee and his colleagues suggests that OCR stem cells actually make young bone and cartilage, but both OCR stems cells and MSCs contribute to bone maintenance and repair in adults. Mukherjee also suspects that OCR cells may play a role in soft tissue cancers. A research team from Stanford University School of Medicine just released a similar study that used a different methodology to identify the same stem cell type. Massive injuries to the face can cause bone loss and “tooth avulsion.” Medically speaking, avulsion simply refers to the detachment of a body structure from its normal location by means of surgery or trauma. Dental implants and help with lost teeth, but if the facial bone has suffered so much loss that you cannot place implants in them, then you are out of luck. Dental prostheses can help, but these do not always fit very well. Darnell Kaigler and his group at the University of Michigan Center for Oral Health wanted to help a 45-year-old woman who had lost seven teeth and a good portion of her upper jaw bone (maxilla) as a result of massive trauma to the face. This poor lady had some dentures that did not fit well and a mouth that did not work well. Bone can be grown from stem cells, but getting those stem cells to survive and do what you want them to do is the challenge of regenerative medicine. Therefore, Dr. Kraigler and his group used a new technique to help this young lady, and their results are reported in the December 2014 issue of the journal Stem Cells Translational Medicine. First, Kraigler and his co-workers extracted bone marrow stem cells from a bone marrow aspiration that was taken from the upper part of the hip bone (the posterior crest of the ilium for those who are interested). They used a product called ixmyelocel-T from Aastrom Biosciences in Ann Arbor , MI. 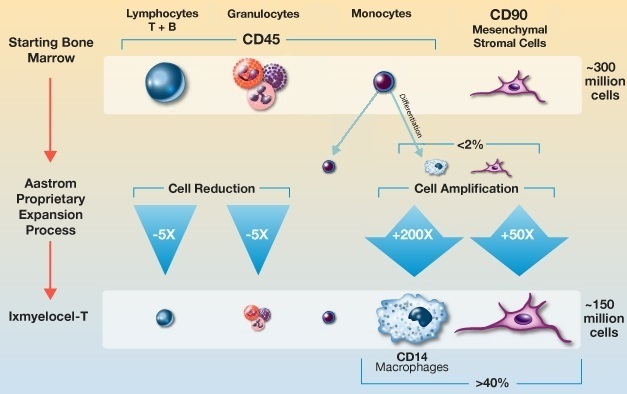 This product is a patient-specific, expanded multicellular therapy, cell-processing system that selectively expands mesenchymal cells, monocytes and alternatively activated macrophages, up to several hundred times more than the number found in the patient’s bone marrow, while retaining many of the hematopoietic cells collected from only a small sample (50ml) of the patient’s bone marrow. Thus, the healing cells from the bone marrow are grown and made healthy, after which the cells were bagged and frozen for later use. Then the patient was readied for the procedure by having the gum tissue cut and lifted as a flap of tissue (under anesthesia, or course). Then four holes were drilled into the bone and setting screws were inserted. This is an important procedure, because implanted stem cells will not survive unless they have blood vessels that can bring them oxygen and nutrients. By drilling these holes, the tissue responds by making new blood vessels. To this exposed surface, the bone marrow-derived stem cells were applied with a tricalcium phosphate (TCP). TCP is a salt that will induce mesenchymal stem cells to form bone. Once the TCP + stem cell mixture was applied to the gum, a collagen membrane was placed over it, and the gum was then sewn shut with sutures. Cell transplantation procedure. Front view (A) and top view (B) of the initial clinical presentation showing severe hard and soft tissue alveolar ridge defects of the upper jaw. Following elevation of a full-thickness gingival flap, the images show front view (C) and top view (D) of the severely deficient alveolar ridge, clinically measuring a width of only 2–4 mm. Front view (E) and top view (F) of the placement of “tenting” screws in preparation of the bony site to receive the graft. Placement of the β-tricalcium phosphate (seeded with the cells 30 minutes prior to placement at room temperature) into the defect (G), with additional application of the cell suspension following placement of the graft in the recipient site (H). Placement of a resorbable barrier membrane (I) to stabilize and contain the graft within the recipient site, and top view (J) of primary closure of the flap. Four months later, the patient underwent a cone-beam computed tomography (CBCT) scan. The bone regrowth can be seen in the figure below. Cone-beam computed tomography (CBCT) scans. CBCT scans were used to render three-dimensional reconstructions of the anterior segment of the upper jaw and cross-sectional (top view) radiographic images to show volumetric changes of the upper jaw at three time points. (A, B): The initial clinical presentation shows 75% jawbone width deficiency. (C, D): Immediately following cell therapy grafting, there is full restoration of jawbone width. (E, F): Images show 25% resorption of graft at 4 months and overall net 80% regeneration of the original ridge-width deficiency. Into this newly regenerated bone, permanent dental implants were placed. The results are shown below. Complete oral rehabilitation. Clinical presentation of the patient prior to initiation of treatment (A) and following completed oral reconstruction (B). (C): Periapical radiographs of oral implants showing osseointegration of implants and stable bone levels at the time of placement, 6 months following placement, and 6 months following functional restoration and biomechanical loading of implants with a dental prosthesis. Pardon me, but permit me an unprofessional moment when I say that this is really cool. Of course, this patient will need to be observed over the next several years to determine the longevity of her bone regeneration, but the initial result is certainly something to be excited about. Tricalcium phosphate or TCP has been used to induce the bone-making activities of mesenchymal stem cells. It has also been used in several animal studies as a delivery vehicle for mesenchymal stem cells (for example, see Rai B, et al., Biomaterials 2010, 31:7960–7970; Krebsbach PH, et al., Transplantation 1997, 63:1059–1069; Zhou J, et al., Biomaterials 2010, 31:1171–1179). TCP also seems to support stem cell proliferation, survival, and differentiation into bone. Kresbach and others showed that TCP most consistently yielded bone formation when used as a delivery vehicle for mesenchymal stem cells compared to other biomaterials commonly used, such as gelatin sponges and demineralized bone matrix. However, there are no studies that have ascertained how well stem cells attach to TCP, and this attachment is an important factor in determining how many stem cells reach the site of injury. This study by Kaigler and his group (A. Rajan and others) showed that a 30-minute incubation of the cells with TCP gave sufficient attachment of the cells to the TCP for clinical use. The efficiency of this incubation period was also not affected by the temperature. The other exciting features of this paper, is that most of the materials used in this study were commercially available. The bone marrow stem cell isolation technique was pioneered by Dennis JE, and others in their 2007 article in the journal Stem Cells (25:2575–2582). Effective commercialization of this technique has shown the efficacy of this procedure for clinical use. This paper also shows the clinical feasibility of using TCP as a delivery vehicle for mesenchymal stem cell-based bone treatments. Human amniotic epithelial cells have the capacity to differentiate into several different cell types. To that list, we can now add bone. A study from Steve G.F. Shen at his colleagues at the Shanghai Jiao Tong University School of Medicine, Shanghai, China has used human amniotic epithelial cells to regenerate the tooth sockets in laboratory animals. The first set of experiments examined the ability of human amniotic epithelial cells (hAECs) to form bone under controlled laboratory conditions. Then hAECs were loaded into artificial scaffolds that were then placed into the mouths of rats with tooth socket defects. In culture, hAECs expressed bone-specific genes 10-14 days after induction. The cells also changed shape and made bone-specific proteins. When implanted into rat tooth sockets, the hAECs were embedded in a scaffold imbued with growth factors known to induce bone differentiation. These implants improved bone regeneration by directly participating in bone repair of the tooth socket defect. They also had an additional benefit in that they modulated the localized immune response against the implanted scaffolds. This immune response modulation augmented regeneration of the tooth sockets and allowed the implanted cells to get on with the job of fixing the surrounding bone without dealing with insults from the immune system. This study has provided the first evidence that hAECs exhibit direct involvement in new bone regeneration and a localized modulatory influence on the early tissue remodeling process. These cells indirectly contributed to the bone-making process in the alveolar defect. Altogether, these results imply the potential clinical use of hAECs as an alternative stem cell-based for restoring tooth socket deformities. A truly remarkable paper in the journal Advanced Healthcare Materials by Fergal J. O’Brien and his co-workers from the Tissue Engineering Research Group at the Royal College of Surgeons in Dublin, Ireland has examined a unique way to greatly speed up bone regeneration. Mesenchymal stem cells from bone marrow (other locations as well) can differentiate into bone-making cells (osteoblasts) that will make architecturally normal bone under particular conditions. The use of mesenchymal stem cells and a variety of manufactured biomaterial matrices and administered growth factors enhance bone formation by mesenchymal stem cells (M. Noelle Knight and Kurt D. Hankenson, Adv Wound Care 2013; 2(6): 306–316; also see Marx RE, Harrell DB. Int J Oral Maxillofac Implants 2014 29(2)e201-9; and Kaigler D, et al., Cell Transplant 2013;22(5):767-77). Protein growth factors tend to have rather short half-lives when applied to growth scaffolds. A better way to apply growth factors is to use the genes for these growth factors and apply them to “gene activated scaffolds.” Gene-activated scaffolds consist of biomaterial scaffolds modified to act as depots for gene delivery while simultaneously offering structural support and a matrix for new tissue deposition. A gene-activated scaffold can therefore induce the body’s own cells to steadily produce specific proteins providing a much more efficient alternative. In this paper by O’Brien and his groups, the genes for two growth factors, VEGF and BMP2, were applied to a gene-activated scaffold that consisted of collagen-nanohydroxyapatite. VEGF drives the formation of new blood vessels, and this fresh vascularization, coupled with increase bone deposition, which is induced by BMP2, accelerated bone repair. Mind you, the assays in the paper were conducted in cell culture systems. However, O’Brien and his colleagues implanted these gene-activated scaffolds with their mesenchymal stem cells into rats that had large gaps in their skulls. In this animal model system for bone repair, stem cell-mediated bone production, in addition to increased blood vessel formation accelerated bone repair in these animals. Tissue examinations of the newly-formed bone showed that bone made from gene-activated scaffolds with mesenchymal stem cells embedded in them made thicker, more vascularized bone than the other types of strategies. This is not a clinical trial, but this preclinical trial shows that vascularization and bone repair by host cells is enhanced by the use of nanohydroxyapatite vectors to deliver a combination of genes, thus markedly enhancing bone healing. Stem cell-based treatments for bone injuries have made some remarkable strides in the past few years. Unfortunately, a common pitfall of bone-making stem cells is the tendency of these cells to wander away from the site of injury. This “wander lust” among stem cells can inhibit healing and reduce stem cell efficacy. How to keep the cells home? The answer seems to be encasing them in a water-retaining gel that keeps them in place, but degrades once the cells have done their job. Cartilage production has benefitted from the use of these so-called “hydrogels” that encase cells and keep them at the site of injury. However, hydrogels have yet to be tried with bone regeneration. The hydrogels used by Benoit and her colleagues mimic the body’s natural tissues, but they also are biodegradable and disappear before the immune system recognizes them as foreign substances. Benoit believes that the special properties of hydrogels could direct bone-making mesenchymal stem cells to make bone mad repair bone fractures at the site of injury, and then leave the site once the cells have completed their mission. In previous work (M.D. Hoffman, and others, Biomaterials, 34 (35) (2013), pp. 8887–8898), ) Benoit and her co-workers transplanted hydrogel-encased stem cells onto the surface of mouse bone grafts. However, Benoit’s group not only closely observed the behavior of these implanted cells in the animal, but also in culture dishes outside the animal. In these experiments, Michael Hoffman and others grafted decellularized bone into the long bones of mice. Because these grafts had all their living material removed, all the bone healing that occurred would be solely due to the implanted stem cells. Then stem cells that had been genetically engineered to glow a fluorescent green color. The bone material was also coated with hydrogels to keep the stem cells at the site of the bone graft. Then Benoit’s group monitored the bone regeneration process to determine the loss or retention of stem cells at the site of the bone graft in the presence or absence of hydrogels. They used the amount of fluorescence to ascertain the number of cells present at the site of repair. Strangely, Benoit and her colleagues were unable to demonstrate the ability of the PEG hydrogels to control spatiotemporal MSC localization. Therefore, it seemed to be due to the hydrogels and their properties. As it turns out, depending on how the hydrogels are made, they have different rates of degradation. Benoit, therefore, decided to synthesize gel fibers that underwent biodegradation at different rates. Once the hydrogel began to experience degradation, the spaces between the hydrogels fibers increased and this allowed cells to exit the hydrogel. In a series of experiments Hoffman, Van Hover and Benoit showed that the faster the rates of hydrogels degradation, the poorer the retention of the cells within the hydrogels. Retention rates were directly proportional to the hydrogels rate of degradation, since longer-lived hydrogels showed higher levels of cell retention and shorter-lived gels showed shorter retention times. In the words of Benoit and her colleagues: “cell localization at allograft surfaces decays in close agreement with network degradation kinetics both in vitro and in vivo. Such hydrogels with variable degradation rates show promise in not only in bone regeneration, but also in heart attacks in which the initiation of healing might be instigated without invasive surgical procedures that can greatly weaken an already incredibly sick patient.